The Energy Policy and Conservation Act (EPCA), enacted in 1975 in the aftermath of the 1973 oil crisis, sought to clarify US energy policy and promote energy security. Nearly 40 years later, the US has met many of the conditions for energy security, and, as an unintended consequence, the provisions of the Act have come to serve the interests of narrow groups within society rather than contribute, in any real sense, to American energy security. The EPCA, formulated to treat the energy market of the 1970s, restricts market efficiency in exchange for security by making energy more autarkic; it is these market inefficiencies that enable and give rise to rent-seeking. This rent-seeking compromises energy security by attempting to keep domestic energy prices low, thereby encouraging consumption and discouraging production. Thus, the EPCA presents a case of risk of unintended distributional conflict that undermines the original objectives of the legislation. The EPCA offers a study of the need for periodic review and revision of long-standing laws and definite objectives for legislations to better determine when interest groups are violating the intent of the law. This analysis seeks examine the dynamics and political economy of the American energy market and interest groups therein. The analysis will use Meadows’s systems theories to provide structure and address the effects of the Act on the individual oil and gas markets, thereby clarifying the beneficiaries and losers from the present conditions in the market. The distributional conflict will be examined through the lens of Thurow’s The Zero-Sum Society and Mancur Olson’s The Rise and Decline of Nations, supplemented by his earlier work, The Logic of Collective Action. The EPCA sacrificed market efficiency for the sake of security in 1975, primarily by limiting the exports of oil and gas; it thereby enabled distributional conflict by granting undue economic benefits to those that benefit from export restrictions. The market changes and export restrictions in the 1970s create excess domestic supply and lower energy prices in the present. Applying the aforementioned theories of special interests, the benefactors of the present situation, those benefiting from low domestic energy prices, seek to perpetuate the market inefficiencies, while opposition groups, those wanting to sell energy at world prices, seek to overturn them. The small number of players in the distributional conflict ensured that interest groups organized quickly and held enough power to shape the distributional conflict and at a minimum delay, if not prevent, changes to the lucrative niches created as a result of the EPCA. It is this rigidity that undermines security by discouraging new production and adoption of new technologies, both of which depend on high prices. As such, the Act creates the conditions for the existence of interest groups, which then undermine the aims of US energy security. 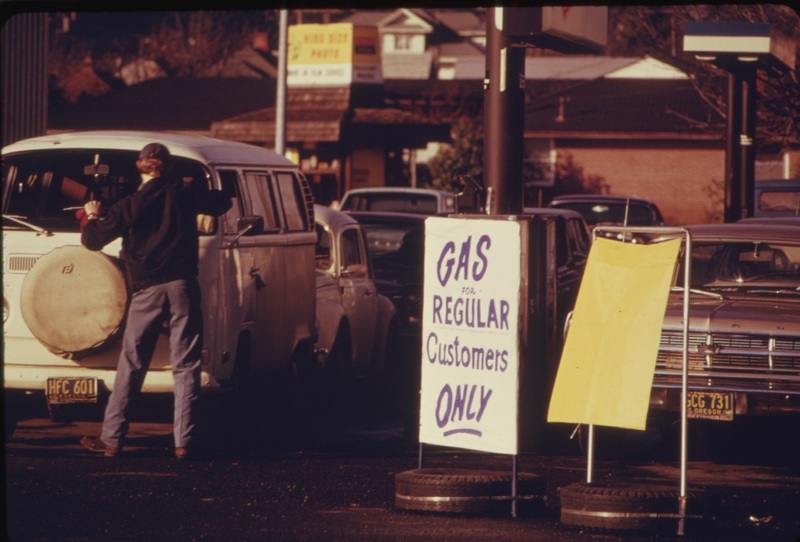 Following the 1973 oil crisis, the EPCA sought to improve energy security in a US economy configured to rely on inexpensive and readily available oil. The EPCA sensibly tried to improve US energy security by adding resilience to the energy market, primarily by addressing supply and demand and the inelasticities therein. The Act sought to encourage diversification away from the use of oil by supporting alternatives such as additional coal usage. The Act also created the Strategic Petroleum Reserve, consisting of up to one billion barrels of oil, with a minimum set at 150 million barrels to serve a buffer in the event of a supply disruption, though the minimum would have only constituted 23 days’ worth of imported oil in 1975. The Act further gave the president the ability to implement contingency plans in the case of an energy emergency, with the added ability to impose conservation and rationing on ordinary consumers and industry in times of extraordinary distress. The EPCA grants the President special control over the export of fossil fuels. Section 103 of the Act allows the President to “promulgate a rule prohibiting the export of crude oil and natural gas produced in the United States” and “exempt from such prohibition…exports which he determines to be consistent with the national interest and the purposes of [the] Act.” As such, the executive enjoys a mandate to impose and remove export restrictions when it suits the national interest, defined nebulously. However, the Act provides a special caveat that the restrictions “shall not apply to any covered product if such covered product is manufactured, sold, or held for sale for export from the United States.” As a result, the Act effectively prohibits the export of crude oil and natural gas, but specifically exempts products derived from crude oil and natural gas – the exact products that most consumers and industries use, such as gasoline and diesel. In the 1970s this caveat was irrelevant as few such products were exported. However, the export ban and the caveat have created substantial market inefficiencies that encourage rent-seeking by beneficiaries. After the 1973 oil embargo, President Nixon introduced his Project Independence initiative, maintaining that by 1980, “Americans will not have to rely on any source of energy beyond [their] own.” He urged Americans to “adopt certain energy conservation measures to help meet the challenge of reduced energy supplies,” and used executive power to introduce limited energy efficiency improvements and lift restrictions on Alaskan oil production. With Nixon’s resignation, Ford carried on the initiative, making energy the main issue in his first state of the union address. In a speech given upon signing the EPCA, Ford made it a priority to give “industry an incentive to explore, develop, and produce new fields” and “expedite the decontrol of crude oil [prices] in order to increase domestic production.” He raised import duties on oil to encourage domestic production and discourage consumption. The Act focuses on bolstering energy security, achieved through increased resilience by diversification of energy sources, promotion of domestic production and conservation, and diversified import partners. The overarching US goal was to ensure that it would not be held hostage to foreign producers, sacrifice growth or suffer a debilitating transfer of wealth from the US to oil producers. Energy prices were relegated to a secondary standing, given that measures taken at the time increased prices directly and indirectly, coupled with a recognition that a sustained level of higher prices leads to increased supply in the future. With these aims, the low domestic energy prices in the present are not an original aim of the legislation. In order to fully understand the manner in which the EPCA creates the opportunities for rent-seeking, establishing a systemic framework of the oil industry is necessary. In this system, two stocks exist: crude oil and refined oil products. Domestic and foreign producers both contribute to the stock of crude oil. Under the EPCA and presidential discretion, most crude exports are illegal and, because oil is usually not useful in its crude form, this stock can only be converted into refined products. The refineries and petrochemical companies form the intermediary and control both the outflow from the oil stocks and the inflow into the oil product stocks. Finally, the oil product stock outflows in two directions; it can flow to domestic or foreign consumers due to the lack of export restrictions on oil products. As a result, the US is a net exporter of oil products as these exports usually receive a higher price on the world market. Adding further complexity, it is important to recognize that crude oil differs widely in quality, with the highest quality oil being low in both sulfur content and viscosity. Most US refining capacity, 52%, is configured to accept low quality crude from Canada, Mexico, and Venezuela. With the US tight oil boom, the market has experienced an influx of high quality crude to the domestic US market that has no choice but to be sold to US refiners. Ordinarily, high quality crudes command a premium on world markets as they can be converted into a larger quantity of high value refined products. The EPCA artificially limits crude exports and thus gives rise to an anomalous situation in which high quality crudes cannot command their due premium. This is the result of inelastic supply as independent producers of shale oil continue producing so long as prices are above average variable costs. This has created a large and inelastic supply of domestic oil. As US refineries control nearly the entire demand for this oil, in addition to maintaining access to foreign supply, they receive inordinate market power. Furthermore, environmental regulations prevent an expansion of refining capacity, with the most recent US refinery coming online in 1976. As a result, the refineries are able to receive high quality oil feedstocks at low prices and then sell the refined products on the international markets at a substantial markup. This market inefficiency has resulted in a record spread for refinery operating margins between the US and Europe. With the prospect of liberalizing crude exports, refiners have formed an interest group to maintain the system that awards them undue economic profit. This mismatch risks curtailing the energy boom by disincentivizing additional production. While similar to the oil industry, the natural gas market has its own nuances, though it remains similarly impacted by export restrictions. Natural gas is not a globalized commodity; it is confined to regional markets due to transportation costs. As such, the primary supply of natural gas in the US comes from domestic producers with a limited imports. Natural gas does not need to be processed to be useful, thus there is no intermediary. It is bound to pipelines, creating several gas stocks that flow from producers to consumers in regional markets. The primary consumers of gas are private end consumers for heating, power plants for electricity generation, industrial consumers, and chemical companies that use natural gas as feedstock. All four of these consumers benefit from cheap natural gas resulting from export restrictions. Similar to independent oil producers, independent natural gas producers must continue producing to recover initial investment costs, creating the large inelastic supply of gas that brought prices down from a high of $12.69 in 2008 to $4.12 in November 2014. This regional market structure has resulted in vast differences in regional prices and substantial arbitrage opportunities. As a result of restricted exports, the spread between US natural gas prices and those in Japan, the most expensive developed market, remains at $10.25 per million BTU of energy. Given this lucrative opportunity for arbitrage, US natural gas producers, naturally, want to lift the export ban to take advantage of the wide regional price disparities. Although the Executive branch has granted a few export licenses, demand for such licenses far outstrips the pace at which they are granted. US natural gas consumption has increased dramatically in recent years, as low prices discourage conservation and encourage profligate usage. Gas consumption has outpaced real GDP growth by 1.6% on average since 2007, when the US reversed its historic decline in gas production. Thus, export restrictions directly benefit the end consumers of gas. Differentiating between the US in 1975 and 2014 serves to highlight the great strides taken to improving American energy security, both as a result of the EPCA and exogenous factors. 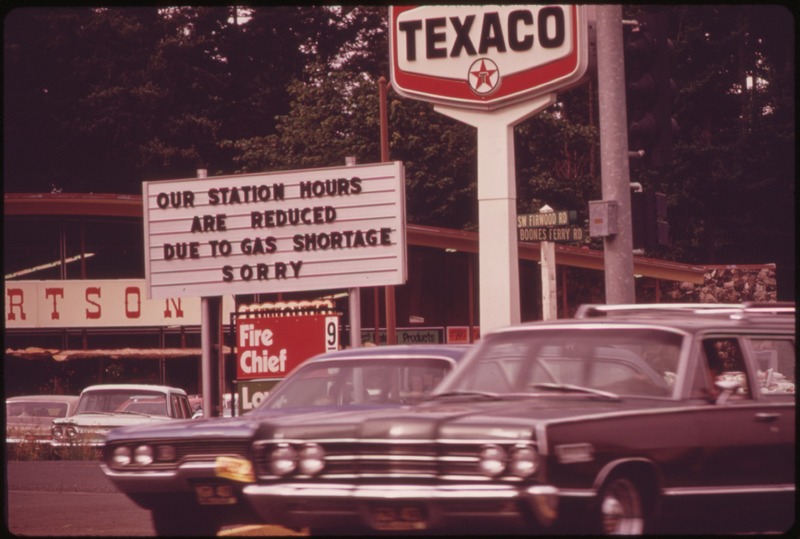 The shock of the 1973 crisis and subsequent legislation did serve to diversify the US economy away from oil. In 1975, the US used about 11 times more petroleum for power generation, which presently accounts for less than 1% of oil consumption. This difference has been filled with increased usage of coal and natural gas. Presently, nearly 70% of oil consumed in the US is used in the transportation sector where demand is most inelastic, up from 55% in 1975. The US has also become much less energy intensive per dollar of GDP. Structural changes shifting the economy to services and increases in energy efficiency and conservation resulting from high prices in the 1970s and 2000s have been largely responsible. With the boom in unconventional oil and gas since 2009, which has come at a time of lower per capita demand, the US is well-positioned for energy security. Additionally, booming Canadian oil production and exports remain captive and oriented for the US market. As a result, the International Energy Agency predicts that “collectively, the United States and Canada become self-sufficient in oil before 2030.” The goals set out in the initial impetus for the EPCA, decline in imports, decline in dependence on foreign producers, increased diversification and alternatives, and increased conservation, without sacrificing economic growth to achieve it, have all been achieved. The US has attained energy security as a synthesis of market and legislative forces. The rent-seeking that the act has enabled is most apparent in the organization of separate interest groups seeking to influence policy decisions on the liberalization of oil and gas exports. Given that the recent US production boom and decrease in overall demand has moved the prospect of exporting substantial quantities of oil closer to reality, this has increased the impetus for organization among the various benefactors and losers of the present system. The EPCA gives rise to this particular situation as an unintended consequence, which encourages distributional conflict that works against energy security. The benefactors from the oil export ban remain the refiners which benefit from low US oil prices and high world prices, while the oil producers do not receive a higher price for their oil. The oil industry’s longstanding interest group, the American Petroleum Institute, (API) has already begun the lobbying effort to lift the ban. A more specialized group, Producers for American Crude Oil Exports, (PACE) quickly came into existence in 2014 and represents only a few members in their support for lifting the ban. Together, API and PACE represent all major integrated oil companies and many of the independent producers, all of which forgo revenues from the aforementioned anomalous oil pricing scheme. Consumers and Refiners United for Domestic Energy, (CRUDE) is comprised of independent refiners and opposes lifting the export ban. Both sides are comprised of a relatively limited number of companies; API, by far the largest, only has about 600 members, of which only a handful represent a substantial portion of the market. API’s established organizational capacity has supplied a quick lobbying response. CRUDE and PACE have fewer members and thus have been able to lead an accelerated lobbying effort convince the administration and the public that their position is correct due to faster cost negotiations. As expected in Olson’s theoretical background, the consumer lobby is unorganized because an individual’s benefits from lobbying are diluted while costs are constant and cannot overcome mass freeriding. Insofar as the public is concerned, lower energy prices, most visibly in cheaper gasoline prices, are the major concern. The complexity of energy markets and the uncertainty over the effects of lifting the export ban has prevented a strong public response in favor of either side. Within the natural gas sector, America’s Energy Advantage (AEA) and the American Public Gas Association (APGA) constitute the primary groups opposing gas exports. Both groups assembled shortly after the price crash in 2009 that enabled the prospect of exports. The APGA represents utilities accustomed to receiving cheap gas to sell to end users while the AEA represents the united interests of the largest chemical, fertilizer, aluminum, and steel companies in the US, which either rely on cheap energy derived from natural gas or cheap natural gas feedstocks to manufacture their end products. The AEA and APGA display all the traditional characteristics of an interest group: small size, organizational capacity, seeking to delay or prevent harm to their accustomed business. Once again, the API represents the gas producers seeking to liberalize gas exports from the US, and the individual consumer lobby remains unorganized. The EPCA was enacted during a time of unprecedented national duress; its main objective was the implementation of immediate measures to improve resilience and address slow-moving variables such as general oil demand, efficiency, and conservation. Despite imposing measures and tariffs to raise prices and spur domestic energy production, it was not intended to be redistributional legislation. This is most evidenced in the strict price controls imposed on oil and gasoline in the 1970s and the supplemental Crude Oil Windfall Profit Tax Act passed in 1980 after prices were deregulated to prevent extraordinary oil profits due to legislative action. While the provisions of the Act did work to improve security in the 1970s, the changing market realities have enabled rent-seeking. Interested parties seek to preserve their own economic security by promoting the autarkic measures that keep domestic prices low as expected in Thurow’s formulation of interest groups. The exceptions for refined product exports, which were negligible in the 1970s and 1980s, have currently reached record levels and can hardly be described as promoting energy security. These new realities of American energy of low domestic prices, unforeseen in 1975, encourage profligacy and discourage new oil and gas exploration and production, both of which retard technological progress by disincentivizing new production and efficiency solutions when energy is so cheap. The lobbying of CRUDE, AEA and APGA that focus on preserving market inefficiencies are particularly damaging to energy security and self-serving. The lobbying to remove export restrictions, while also self-serving, increases society’s income and government revenues and promotes conservation and production that feeds into energy security. The lobbying for market inefficiencies serves to make the US less resilient to future shocks and thus undermines the EPCA’s original aim of energy security. The EPCA addresses the energy market of the 1970s and presently provides the circumstances through its export bans that undermine the original aim. The EPCA functioned well in the 1970s energy market to bring about increased US energy security. However, the same inefficiencies that helped bring about energy security in the 1970s function to benefit consumer groups in the present with booming oil and gas production held captive due to EPCA export restrictions. This has led to a distributional conflict as the beneficiaries lobby to preserve their economic security, inadvertently undermining the very aims of the EPCA by attempting to keep energy prices low and decreasing US resilience to future energy shocks. Data derived from British Petroleum. BP Statistical Review of World Energy June 2014. (London: BP, 2014). US Congress. House of Representatives. Energy Policy and Conservation Act of 1975. H.R. 2. 94th Congress, 1975. Gerald Ford, “Statement on the Energy Policy and Conservation Act” 22 December 1975. Ben Lefebvre, “Shale-Oil Boom Spurs Refining Binge.” The Wall Street Journal. 2 March 2014. EIA. “Lower Crude Feedstock Costs Contribute to North American Refinery Profitability.” 5 June 2014. EIA. “Henry Hub Natural Gas Spot Prices.” 20 December 2014. Data compiled by author from EIA Data – EIA, “Monthly Energy Review – November 2014.” 20 December 2014.
 International Energy Agency, World Energy Outlook 2013. (Paris, France: IEA, 2013) p 76-77. Jim Snyder and Brian Wingfield. “Oil Producers Form New Group to Lobby to Lift Crude Export Ban.” Bloomberg. 24 October 2014. Brad Plumer. “U.S. oil exports have been banned for 40 years. Is it time for that to change?” The Washington Post. 8 January 2014. On October 17th, 1973, the industrialized world woke up to a sudden and unprecedented threat to its own growth and prosperity; never before had it faced such a constraint to its growth nor had it ever been so dependent on a resource it no longer had unlimited dominion over, overturning a system in place since 1860. Price shocks and crises of supply were nothing new within the oil market. However, it was the utter helplessness to alleviate the crisis given the dependence on and inelasticity of oil consumption. The US invited the 1973 oil shock through its complacency and revealed the rigidity of the oil supply-demand system. Although elements within the policymaking establishment sounded the alarm in the years prior to 1973, there was no action to prevent or mitigate the blow of a supply crisis. The direct event leading to the embargo was clear – US support for Israel during the 1973 war. The systemic issues were longstanding and pushed the oil supply-demand system in that direction for years. Despite the confluence of events that suggested a high probability of an effective and sustained oil embargo against the West, the US failed to understand the oil supply-demand system and its elements, misreading both the quantitative risk and immeasurable uncertainty, allowing itself to blunder into the crisis and forgo preventative measures. The oil crisis of 1973 presented the industrialized world with a radical departure from its collective experience in the previous oil crises of 1956 and 1967. An easy escape from consequences in the previous crises altered the calculus in the US, forming biases in the evaluation of risk and uncertainty. The outcome of these crises prevented an evaluation of the systemic changes had accrued between 1956 and 1973. Thus, a brief description of the 1956 and 1967 crises is necessary for understanding biases against action before October 1973. In addition to the historical events, understanding the complex system that brought oil from well to consumer is crucial. In an economics system framework of Meadows, the stock of the system is the available supply of oil. The inflow into this stock comes from the producers, the supply-side, and the internal mechanisms that allowed this production. Up until 1973, the major producers of the world were the US and the countries of the Persian Gulf, North Africa, Indonesia, and Venezuela. The Eastern Bloc was generally autarkic and remained outside of this inflow. Within that, it was the Western oil companies that had the expertise and technology to extract oil effectively. Through this power, the companies were able to negotiate the terms of royalties agreements and dictate prices to the world markets through posted, rather than floating, prices. The entrance of smaller independent companies into the market gave host governments leverage to negotiate with them by the late 1960s. Within each producer, there was a different mixture of domestic politics that influenced production – regulatory bodies and environmental legislation in the US and authoritarian and popular politics that influenced production in the remainder. Of the US regulatory bodies, the Railroad Commission of Texas (RRC) was the most powerful, stewarding oil production to encourage conservation and maintain prices in a “situation of chronic potential oversupply,” creating the easily employable spare production capacity in the US. Indeed, it controlled more oil production than all other major producers. The RRC served as both a buffer for the system and a regulatory feedback loop that regulated prices around a band to avoid the volatility that characterized the oil market in its early years. The main objective of the supply side of the oil market system was to provide abundant oil at relatively cheap prices; it was produced these exact results, much to its own detriment. The demand side of the system, to which the stock outflowed, consisted of the major industrial economies, the US, Western Europe, and Japan and the subsystems that defined their level of oil consumption. Fueled by both economic expansion and preference against polluting coal, these economies expanded their use of oil for power generation, spurred on by seemingly endless cheap oil prices. As these countries became ever more reliant on oil for transportation and electricity, their demand increased and became more inelastic, making the system more rigid and precariously balanced on an oversupply of oil. This created an unsustainable reinforcing feedback loop that oversupply of oil kept prices low, which encouraged profligate oil use, which further tightened supply. Eventually, prices had to increase in accordance with supply and demand, or the rigid system would suffer a shock. By the time Gamal Nasser finished excoriating erstwhile European colonial powers in his speech in Alexandria on July 26, 1956, the Egyptian army had already moved forward and seized the Suez Canal. The Canal was the crucial supply line to Middle East oil, and the British and French governments decided to bring it back under Western control. British Prime Minister Anthony Eden complained to Eisenhower that “Nasser can deny oil to Western Europe and we shall be at his mercy.” Ironically, Eisenhower would be the one denying oil to Western Europe in short order. US contingency plans for an oil shortage among the European allies centered on the Middle East Emergency Committee, which was tasked with coordinating the resources to draw on American spare oil capacity and reroute the tanker lines to supply the Europeans. The French and British, assuming they would have American support, coordinated with the Israelis to launch a joint intervention and seize the Suez Canal on October 24th, 1956. Eisenhower, fearing that military action could generate instability in the Middle East and open an opportunity for Soviet gains in the region, was furious with the Europeans. Nasser scuttled several ships in the Canal as a result of the war, shutting it down and forcing the oil supply lines to go around Africa and thus constricting supply to Europe. With Britain and France in the middle of an oil supply crisis, Eisenhower refused to activate the emergency resupply committee and actually imposed oil sanctions on them until they accepted his demands for withdrawal. Meanwhile, Saudi Arabia also embargoed Britain and France to little effect. Under political and economic pressure, Britain and France fully withdrew from Egypt, at which point the US finally activated its emergency committee to make up the oil shortfall. The lesson was clear; the US was able to impose its will through its abundant oil resources. Although a European crisis, the 1956 oil shock confirmed US energy security. By 1967, the global oil market was changing but was not a radical departure from 1956. OPEC had come into existence in 1960, but it was still an ineffective coordinating body. The industrialized world consumed ever greater quantities of oil, averaging 35.5 million barrels each day in 1967, accounting for 45.7% of all domestic energy consumption. On the eve of the Six-Day War, Europe imported 75% of its oil from the Arab exporters, leaving it vulnerable in the short term. On June 5, 1967, Israel preempted an attack by the Arab states of Egypt, Syria, and Jordan, quickly overrunning their positions. For their support of Israel, the Arab exporters imposed an oil embargo against the US, UK, and West Germany on June 8, reducing production by 60% and precipitating an immediate oil crisis in Europe. The US set into action, with the RRC allocating an additional million barrels of production to make up the shortfall, resupplying Europe and saving it from the crisis. By July, the oil weapon and the embargo had failed; the Arab exporters gave up revenues while continuously subsidizing the Arab belligerents. The Arab producers had to increase production to maintain their market share, thus Arab production was 8% higher after in August than just before the war. Once again, the US, as described by the National Security Council in 1960, was “Europe’s principal safety factor in the event of denial of Middle East oil.” However, it took a mere six years for this margin of safety to erode. By 1973, the confluence of several factors eroded the energy security of the industrialized world, even if the perceptions of security remained. The US passed a significant milestone in March, 1971, when the RRC allowed full production for the first time under normal circumstances; the spare capacity of 4 million barrels a day during the period of 1957 to 1963 had been whittled down to 500,000 barrels in 1973, only 1% of industrial world consumption. As a result, the US was importing 36% of daily consumption by 1973. As early as 1968, the US State Department had informed the OECD countries, much to their surprise, that the US would soon be left with no spare capacity and unable to provide emergency relief. Contemporaneously, the industrialized nations were undergoing an economic boom, with 1973 GNP growing at 10.4% in Japan, 5.9% in the US, and 5.4% in Western Europe. The oil glut of the previous 20 years kept prices low, incentivizing the switch from coal to oil electricity generation for economic and environmental reasons. Compounding the issue, the ordinary consumers became accustomed to boundless cheap energy; efficiency and conservation became an afterthought. Oil thus constituted 46% of all energy consumption in 1972, up from 28.9% in 1950. These changes added not only demand but short-run inelasticity to the system of demand. On the supply-side, low oil prices made more expensive production uneconomical, an issue further compounded by increased environmental regulation. A victim of its own success, the cheapness of oil encouraged profligate use, which fed back into the system, making it even more rigid and vulnerable. Just as the demand was becoming more inelastic, the major oil companies came under pressure from independent producers, which were offering host countries better royalties agreements. Nascent revolutionary regimes in Libya, Algeria, and Iraq seized upon the opportunity, isolating the companies and gaining concessions. Once Qaddafi wrested a 55% share of the profit from oil sales in 1970, the event changed the entire supply-side dynamic; 55% became the minimum acceptable to host governments. With profit sharing altered, the issue of price became the main negotiating point. The abandonment of the Bretton Woods System and relaxation of the gold standard devalued the US dollar in the early 1970s, bringing down the real posted price of oil. Suddenly, the oil companies came under further pressure to raise posted prices, which had remained nominally the same since 1961. The US government was unconcerned with this development at the time, as the pressure to increase prices “did not immediately seem threating to a range of interests broader than those of the corporations immediately involved.” These events significantly increased quantifiable risk in the system as a function of import dependence, tight supplies, and inelastic demand, suggesting a higher probability of a shock. As the US ignored the risk, it also misread the uncertainty of the situation and gauge the probability of an impending disaster. Warnings did come from within the government. A 1970 State Department report recognized the changes in the oil market, warning that producing countries will be able to collude in raising prices and determining production, yet “no one in Washington paid any serious attention to the message.” Contrarily in the same year, the president’s Task Force on Oil Imports predicted “only five million barrels per day would need to be imported, and most of this could come from the Western Hemisphere” by 1980. The projection was already exceeded by 1971. Another alarming State Department report by James Akins, a senior Foreign Service Officer, encouraging “the development of alternative energy sources, and controlling [American] consumption” to reduce dependence. Akins published his concerns publicly in his article “The Oil Crisis: This Time the Wolf is Here” in Foreign Affairs in 1973. Akins was able to separate the signal from the noise, recognizing the changing dynamics of US spare capacity, demand inelasticity, and changes in the Middle East that put OPEC in “[control of] a product which is irreplaceable in the short run, and is vitally necessary.” The view of Akins and the State Department were controversial, particularly the projections of price increases seen as impossible, while opposing viewpoints, those of an impending oil glut, proliferated in Washington. In a sense, the “warning flags were up, but there was no particular response, nor…was there the requisite consensus either in the United States or among the industrial countries as a group that would have been needed for more concerted prophylactic action.” Indeed, “before 1973, there was no policy at all envisaging a serious confrontation with OPEC.” Understandably, in the 1960s, it was assumed that spare capacity of two million barrels would still prevail in 1975 and the US even rejected an offer from the Shah of Iran in 1969 to deliver “1,000,000 daily barrels of oil for ten years at $1.00 per barrel in order to establish a stockpile” as a buffer in the system. The risk was in place; the uncertainty was made difficult by the multitude of opinions and misunderstanding of the supply and demand system. As the US entered the oil market as a major importer, market prices for oil began to exceed those of posted prices. In the tight market, some Arab leaders, particularly Sadat, were insisting that the oil weapon be used to realize political goals. King Faisal of Saudi Arabia, historically dovish, rejected this use of oil, preferring American favor as a counteracting force against instability and communist incursions into the region. However, Faisal was vulnerable to public perceptions; he had to maintain solidarity with Egypt and the Palestinians or risk suffering terrorist attacks on oil infrastructure. Faisal genuinely did not want conflict with the US, but continued support for the US would isolate Saudi Arabia from the other Arabs. In light of recent devaluations of the dollar, Faisal began to reconsider his position and warn that the Saudis would “not increase their oil production capacity to meet rising demand, and that the Arab oil weapon would be used in some fashion, unless the United States moved closer to the Arab viewpoint and away from Israel.” This reality was impressed upon the oil executives at Aramco, the Western firm responsible for extracting Saudi oil, who conveyed the message to an unconcerned US government: there was “a large degree of disbelief that any drastic action as imminent or that any measures other than those already underway were needed to prevent such from happening.” The Saudis continued to message that King Faisal is “one hundred percent determined to effect a change in US policy and to use oil for that purpose.” Although such messaging was designed to convince the US of the seriousness of the threats, and even Nixon announced at a press conference that the use of the oil weapon to change US policy “was a subject of major concern,” there was little “contingency planning relating to possible OPEC and producer country actions” or more overt messaging to assuage Arab concerns. Despite the use of the embargo in previous crises, the administration took no action. As the Arabs prepared to launch the 1973 war against Israel, Western and Israeli intelligence indicated that the event was unlikely. As a result, the October 6 surprise attack on Israel worked as planned, with Egypt and Syria scoring several initial victories. Meanwhile, the negotiations over posted prices between exporting governments and the companies were at a standstill. The countries decided to unilaterally raise prices to those of the spot market, instantly increasing oil prices by 70% to $5.11 a barrel. This event changed the entire supply-demand radically from its structure in 1967. At this point, unaccustomed to high oil prices, the US was already facing an energy crisis. The US only wanted to avoid involvement in the 1973 war. However, given Soviet supply shipments to Syria and Egypt, the US decided to resupply Israel and keep it in the war, thereby confirming its favor of Israel over the Arabs. Henry Kissinger tried to frame the actions as anti-Soviet rather than anti-Arab, erroneously still believing that the Arabs would not use the oil weapon. On October 17, the OPEC oil ministers agreed to cut overall production by 5% each month until their political objectives were realized and the US ended support for Israel. The cuts in absolute supply pushed prices to $11. The US then announced a $2.2 billion aid package to Israel. Thus everything was in place, a tight market, organization, a willingness to use oil for political ends and no emergency supply; the wolf was at the door and the US all but invited it into the house. On October 20th, this final public action prompted the immediate embargo of oil exports to the US from the Arab states. Thus the US was caught almost totally by surprise by the imposition of the Arab oil embargo, which it had consistently assumed would not materialize. The effects were disastrous for the US economy, which had grown so reliant on cheap oil, and it went into recession, spending the better part of the 1970s dealing with stagflation and unemployment. Yergin, The Prize, p. 467. Philip, George. The Political Economy of International Oil. (Edinburgh: Edinburgh University Press, 1994): p. 156. Yergin, The Prize, p. 569. Akins, James. “The Oil Crisis: This Time the Wolf is Here.” Foreign Affairs. April 1973. Yergin, The Prize, p. 573. Lovejoy, Wallace and Paul Homan. Economics Aspects of Oil Conservation Regulation. (Baltimore: The Johns Hopkins University Press, 1967): p. 112. Yergin, The Prize, p. 577.